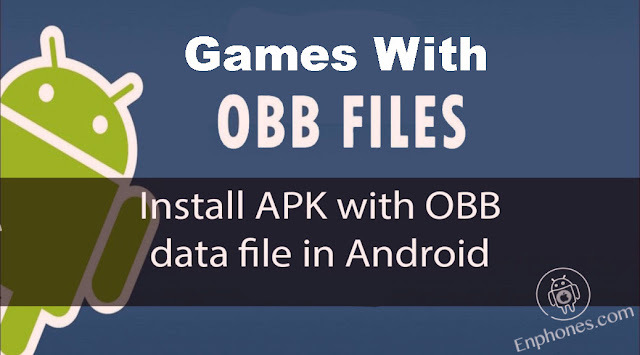 OBB is not an android installation package, It's an application data file/folder that developers create along with some APK packages to support the application. the OBB files contain bundles of large assets. These files carry more data including media, graphics... that is not included in the APK. the most HD Android games comes with obb file which contains the whole game data. here we will tell you how to install the APK files that have the DATA or OBB with them. So let we start installing APK with OBB files. Files explorer like Es File Explore or X-plore..
1. You need first to download the apk and obb data of the game to a folder. 3. Extract the game data file with your files explorer to get a folder named like "com.Gameloft.Android.Gloft". 5. That All! when the folder has been moved successfully, you can now launch the game from you phone menu and play.